At last the time approaches for my book manuscript to be submitted on 1 August. So guilty thoughts can now be spared for the ailing blog. As a result of one such guilty thought springing to mind as I mowed the lawn in advance of a rental inspection tomorrow, here I am reviving the poor neglected thing. I've rejigged the title of the book, as the focus has changed somewhat from my PhD thesis, which focused on the connections between empire and mothering. 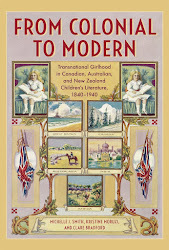 The revised title is "Empire in British Girls' Literature and Culture: Imperial Girls, 1880-1915". In my mind I was hoping for "Imperial Girls" to occupy the coveted position before the colon, but the editors felt that it did not clearly indicate what the book was about. While this is true, it did make me think of Madonnna's "Material Girl" and hence that I might be staking a claim for some degree of cultural relevance for Victorian and Edwardian girlhood. But then, it's not about Madonna anymore, but Lady Gaga, so then we'd get down to something nonsensical like "Imperial Face" or "Victoriandro". I actually thought it would make a nice companion to Joseph Bristow's "Empire Boys". Nevertheless, this is my first book and I'm not a publishing expert, so this "talent" is not about to be difficult. I'm mightily happy with the cover image, which is hopefully going to be the fine, patriotic girl you see before you in this post. 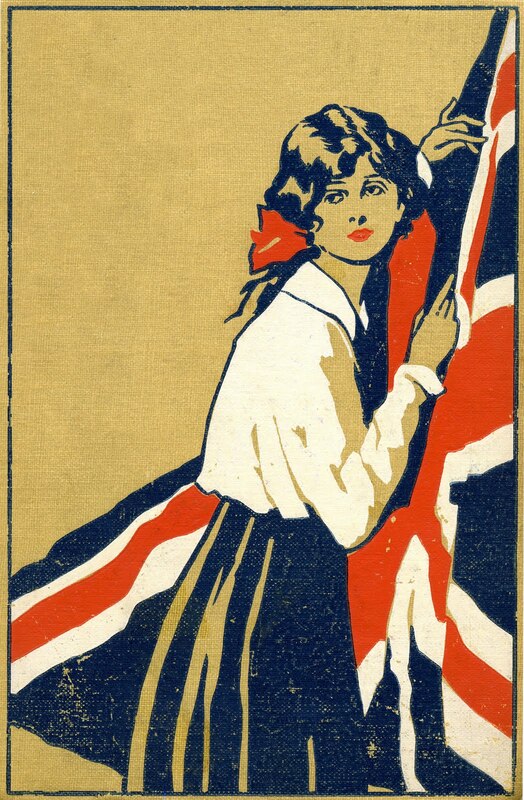 The original book, A Patriotic Schoolgirl by Angela Brazil, was published after my time period, but the image was so appropriate that I had to use it. I've certainly learned a great deal about copyright law in gaining permission for images. Frustratingly, some of the illustrators I'm dealing with died less than 75 years ago, which leaves their works still in copyright. Children's books publishers have often shut up shop in the interim and the rights to old children's books that will never likely be published again are not sought after so many trails are cold and lead nowhere. It's strange to think of the rampant downloading going on with music, movies and tv shows to the point that stores are closing and labels downsizing, but the book world is still sticking with the straight and narrow in terms of permissions, the last bastion of copyright compliance. I wonder if the eBook is going to see massive piracy and downloading impinge on sales? Not that I need to worry about my own small revenue from eBook sales, but I dread the thought of the physical bookstore going the way of the record store. I suppose it's similar to the bookless library. That said, I have been grateful for the ability to borrow an eBook at short notice rather than having to trek in to a university library to look up a small piece of information. It feels traitorous to even do so. While my interested has been sparked by the iPad, it feels like it would be joining the dark side to buy one. It seems we're still in the "early adopter" phase and, for some reason, I don't like being seen as arriving "early" to the consumer party. I'll walk in fashionably late in a few years' time when I begin to be ostracised for not owning one. Yeah, the record store went in a sad, sad way. But we still will have music. Same with books: there will be more readings and interactings.